When the first fleet arrived in Australia in 1788, there were seven horses aboard. By 1901, when Australia became a federation, there were around 1662000 horses in Australia, roughly one horse for every two people. In effect Australia was a horse dominated society. Our city streets were filled with pervading smell of horse manure and swarms of flies making a meal out of it. But winds of change were around the horizon. A new era of horseless carriages has begun in Europe and the breeze has already reached the shores of Australia. Though sensible people had no doubt that Motor cars would one day replace the horse driven carriages, some old heads sticked to the belief that Horses will prevail. An Article on Newcastle Morning Herald and Miners’ Advocate (NSW : 1876 – 1954) on Saturday 9 January 1897 is a good example for that. THE HORSE VERSUS THE MOTOR CAR. The faith in the future supremacy of the motor-car over horse-drawn vehicles is not universal was clearly evident recently at the inaugural dinner of the English and Colonial ” Minerva” Nail-less Horse-shoe Company (Limited), held at the Hotel Cecil. No doubt appeared to be entertained, in deed, that, whatever improvement might be made upon the present somewhat crude form of mechanically-driven carriages, the demand for horses would in no wise diminish, but would rather tend to increase almost, if not quite, as much as if no competitor had entered the field. 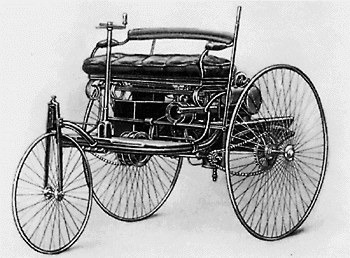 In 1879, Karl Benz was granted a patent for his first car engine in Germany, which he had been designed in 1876. Within a decade the first imported car arrived in Australian shores in 1897. The biggest complaint against cars were that it frightened the horses. The early motor cars that graced Australian streets were mostly imported from Europe. This country of settlers always maintained their intellectual superiority and Australians built their own motor cars when Europe was spearheading in car engineering. In 1896, in a modest little workshop in High st. Armadale, Mr Herbert Thomson and his cousin, Mr. Edward Holmes, built the “Thomson Motor Phaeton”, a steamer. Thomson had big plans for his car. The car was displayed at the Royal Melbourne show. 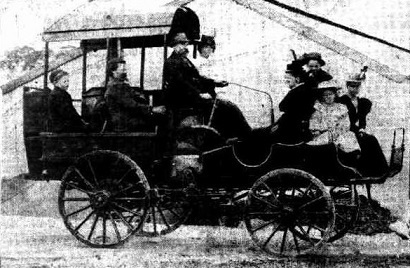 Among the notable passengers of the car at the Royal Melbourne Show was the Governor Lord Brassey. Many people thought that the Governor is taking a serious risk by being a passenger in the car. Steam boiler explosions were not rare at that time. But in this model the risk had been eliminated by using a tubular boiler invented by Walter Hancock in 1830. Thomson took the car to Sydney for the Royal Show. In Sydney, the authorities demanded a test run before issuing permit to drive in City streets. The car was test driven with the supervision of deputy chief of the fire brigade before a permit to drive on the streets were granted. Encouraged by the performance of the car, Thomson decided to drive it back to Melbourne from Sydney, a feat no one tried before him. This feat made a sensational news around Australia. One Melbourne News Paper reported that Australia caught its breath in amazement. It took 56 hours 36 minutes —an average speed of eight and a half miles an hour, despite many long stops during which the car was explained to enthusiastic crowds. Fuel consumption was 42 gallons of kerosene. After demonstrating to the farmers of his time that the horseless carriage was a possibility, Mr.Shearer did not persist in his experiment and turned his attention to the manufacture of harvesters, strippers, harrows and ploughs. Thus Australia was probably deprived of the all Australian motor car. The only idea not found in the modern car and which was incorporated in Mr. Shearer’s was one of motive power. Mr. Shearer drove his car by means of a steam engine with a horizontal boiler designed by himself. Other early steam car pioneers were Johann Ziegler of Allansford, Victoria, and Grayson and Co. of Fitzroy, Victoria. Petrol cars appeared almost as early as steamers. The first that had any Australian background was designed by John Pender a Brunswick, manufacturer of horse shoe nails, but he had it built in the United States. The first Australian-built petrol car by Tarrant Company, was the design of two men from Melbourne, who later became widely known in the motor industry, Colonel Harley Tarrant and Howard Lewis. The car was manufactured in 1899 with two-cylinder engine and electric ignition. But the car was a failure. Their second car was completed in 1901 and it was sold to W.H.Chander a hardware merchant. The next four years Tarrant company built few more cars of two and four cylinder engines. The Tarrant company cars were of very good quality and in 1905 its car tied with four imported cars in the Dunlop trial from Melbourne to Sydney. The first car manufactured in New South Wales was a twin-cylinder called the Australis, in 1904 to the design of Albert Woods, of Leichhardt. The most successful pioneer builder of Australian cars was Adelaide’s Felix Caldwell, who invented a four-wheel drive system in 1907. He built his first truck in 1911, using the invention, and founded the Caldwell Vale Co. of Auburn, New South Wales. This concern built 50 four-cylinder trucks, which were sold to the Government and private firms. The price was £1250 each. Caldwell later invented a system of four-wheel steering combined with four-wheel drive, and the 30HP utility he built on these lines claimed to be the ancestor of the jeep — was capable of outstanding feats in sand and mud. In 1904, F.B.Puckridge built a car for Dr E. Kinmont at Port Lincoln. It had an air cooled engine, a two speed gearbox with no reverse and no differential. The car ran well, but no more were made. After the World War I the history of Australian Car manufacturing was mostly about assembled in Australia machines rather than manufactured machines. From 1920 onwards there were the Australian Six, the Summit, the Eco and the Wege. All contained a proportion of local parts combined with imported major components. G. Hamilton Grapes, the Melbourne engineer who designed the Eco, was a specialist on carburetion and pioneered thermostatic control of induction manifold temperatures. His induction design was developed at the American Zenith factory in Detroit. It featured an extremely hot retort chamber off the manifold itself, into which un vaporised fuel was thrown by centrifugal action. The car ran well on kerosene and other heavy fuels after warming up on petrol. Another unusual feature was cast aluminum disc wheels. Two or three cars were built in 1924 before the company folded up. 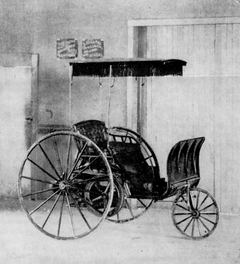 In 1897, An Australian named John Pender imported a buggy to Melbourne. It more or less looked like two bicycles joined together. This two-cylinder vehicle did not have a steering wheel but had a tiller. The cars that were imported were either run by steam or gas, but petrol engines changed the scene all together. The early petrol cars were difficult to drive and hard to start and remain smelly and noisy in their early stages. So for a short while people preferred electric powered cars. But electric cars lost the supremacy because they were not as good and charging stations were rare. The first imported car in NSW arrived in 1900. In 1900, W.J.C Elliot imported a De Dion Bouton. They sold it to Lew Osborne. Later in 1900, Henry Vale imported three Benz cars from Germany. Car registration began 1909. In 1892, in Queensland James Trackson imported a steam buggy. 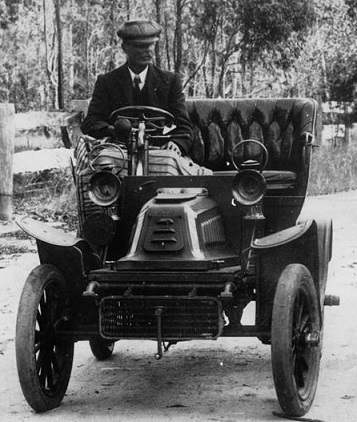 He was the first one to drive petrol driven car in 1900 in Brisbane. Soon the enthusiasm towards motor cars shifted to setting high speeds and races. Dunlop was the first to organise a Melbourne – Sydney car trial. The first car trial ran on February 1905. The cars were divided as light and heavy. Light was defined as below 545 Kg and heavy above that. Record breaking became a great feature of this period. Henry Ford’s Model T has come out in 1908 -09. The car conquered Australia because it was the cheapest and reliable car at that time. It had a high ground clearance so it could go through most bumpy terrains. On those days Australia never had many proper roads. Moreover, Australians considered that American Cars suited more for Australian Conditions than European cars as both countries were settler’s paradises. Now Australia has only three large scale car manufacturers with assembly lines – Ford, Holden and Toyota. But by 2017 all these three manufacturers will exit Australia. In 1926 J.F. Crosby decided to invest in Eclipse Motors Pty Ltd of Melbourne. In 1929 Eclipse secured Victorian agency for Standard Motor Company’s cars and changed the name to Talbot and Standard Motors. In 1952 Crosby family formed a holding company Standard Motor Products Pty Ltd in corporation with Standard Motor Company of England. The company started an assembly plant in Port Melbourne to assemble Standard Motor Cars. In 1958 company started assembling and distributing Mercedes Benz cars with an agreement with Daimler-Benz. The Company also changed its name to Australian Motor Industries (AMI). In 1960, AMI signed an agreement with American Motors Corporation to assemble the Rambler range of cars from complete knock down kits. In 1963, company secured Australian franchise for Toyota cars and started assembling the Tiara Model. This was the first Toyota car ever built outside Japan. By 1967 company was assembling 32 different models of cars for various car manufacturers for the Australian market. In 1965 AMI lost its assembly rights for Mercedes Benz cars. Soon AMI started assembling other models of Toyota, namely Crown, Corolla and Corona. In 1968 Toyota purchased controlling interest in the company. In 1985 AMI renamed itself as AMI Toyota Ltd.
Toyota in 1989 amalgamated the company with its other Australian operations to form two arms. Toyota Motor Corporation Australia and Toyota Motor Sales Australia. In 1856, within four years of arriving in Australia James Alexander Holden established J.A. Holden & Co, a saddlery business in Adelaide. In 1855 he took in a junior business partner Henry Frederick Frost and renamed the company as Holden & Frost Ltd. James Grandson, Edward Holden joined the company in 1905 and the company entered into the business of repairing car upholstery. In 1913 company started producing motor cycle side car bodies and later went into producing complete vehicle body shells. In 1919, J.A Holden founded a new company Holden Motor Body Builders Ltd specialising in the manufacture of car bodies. Holden Motors started assembling bodies of Ford cars. From 1924 Holden became the exclusive supplier of car bodies for GM Australia. In 1931, GM Motors purchased Holden Motor Body builders and formed General Motors Holden Ltd.
Ford Australia was founded in Geelong, Victoria, in 1925 as an outpost of Ford Motor Company of Canada, Limited. At that time Ford Motor Company of Canada had the manufacturing right to Ford in British Empire except the United Kingdom. Geelong was the headquarters of Ford Australia. The Geelong plant assembled Ford Model T from complete knock down kits provided by Ford Canada. Since 1972, Ford’s falcon model has been fully Australian designed. Ford has two main factories, both in Victoria: located in the Geelong suburb of Norlane and the northern Melbourne suburb of Broadmeadows. In 1961 Ford moved the headquarters to Broadmeadows. Ford closed down its manufacturing operations in Australia in 2016. After the World War II, Volkswagen brand and the company was offered to representatives from the American, Australian, British, and French motor industries as a reparation. Volkswagen was owned by the Nazis. All of them rejected the offer. The Australian Government investigated the offer by sending a team to Germany. The team decided that ‘Beetle’ was not suitable for Australian conditions so not to take up the offer. Since there were no takers Volkswagen had to rebuild itself.